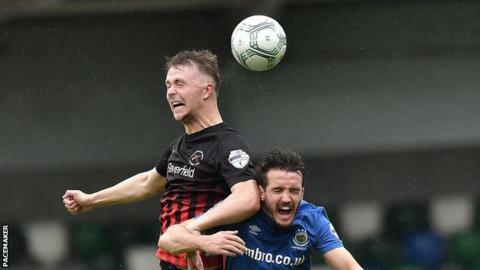 Ballinamallard United are still hopeful that Josh McIlwaine will feature in the Irish Cup final as the County Fermanagh side prepare to contest the striker's three-match ban. McIlwaine was sent off on Saturday after an off-the-ball incident with Carrick Rangers' Caolan Loughran. The Mallards are hoping to have the punishment reduced to a two game suspension. Harry McConkey's side will face Crusaders in the final on 4 May. The appeal will be submitted on Tuesday afternoon and, if successful, McIlwaine would likely miss Ballinamallard's final Championship fixtures against Portadown and league champions Larne.